Who is ready for a little Christmas DIY? I just love fresh evergreens but sometimes an unexpected touch can really brighten up a space. This modern take on a christmas wreath is easy to recreate, a great way to reuse scrap wood and easy to store thanks to it's slim profile. 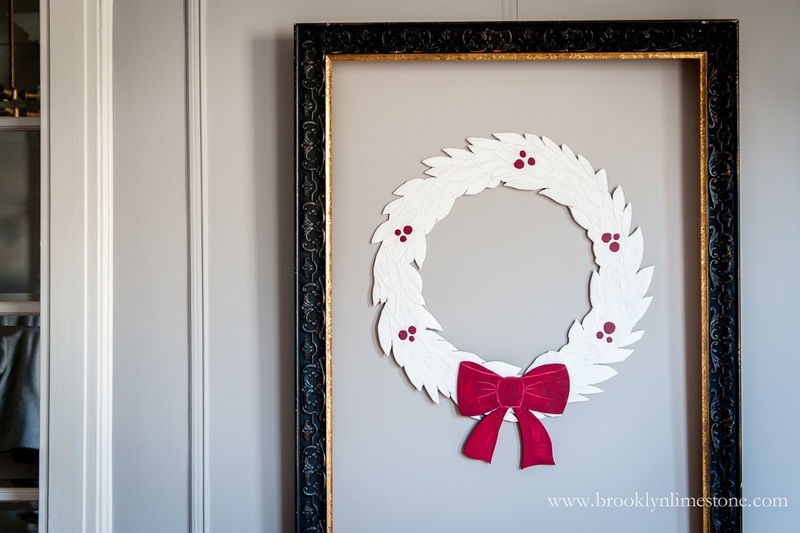 You'll need a piece of plywood as large as you want your wreath as well as a pencil, a drill, a popsicle stick along with whatever colors of paint you prefer. Start by drawing your wreath and bow (optional). You want to have some variation and imperfection here to mimic nature so the ability to draw properly is not a required skill. And in case it really goes off the rails, you can always erase and start over. 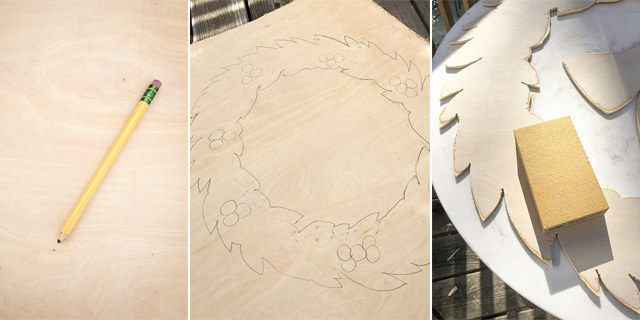 Once you are happy with your shape, use a jigsaw and drill to cut the wreath out. I can never seem to get perfectly clean cuts (I think I'm using the wrong blade - anyone have tips?) but it doesn't matter because those jagged edges will be smoothed out with a light sanding and then covered up by paint. Again, perfection need not apply. When you've finished your cuts, sand down the front and edges to make reasonably smooth. Wipe away any sawdust from the pieces. Using a mixture of about 2/3 paint, 1/3 water, cover a small piece of the wreath. 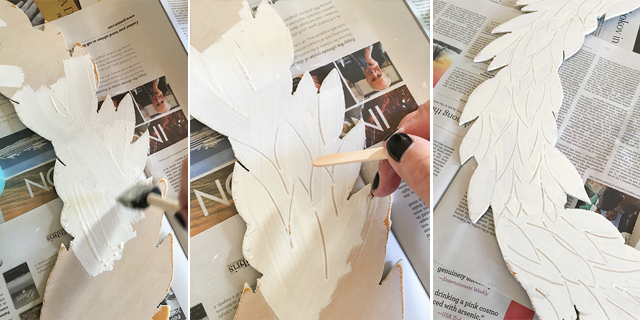 Then create the leaf shapes by dragging the edge of a popsicle stick to make marks in the paint. Continue doing this all around until you have covered the wreath. Allow to dry completely. 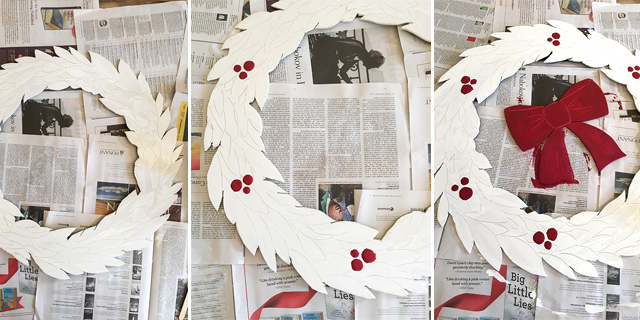 To add the red "berries" drop blobs of red paint in clusters of three around the wreath. While that is drying cover the bow shape in the same red paint and use the same popsicle stick technique to add some simple detail to the bow. 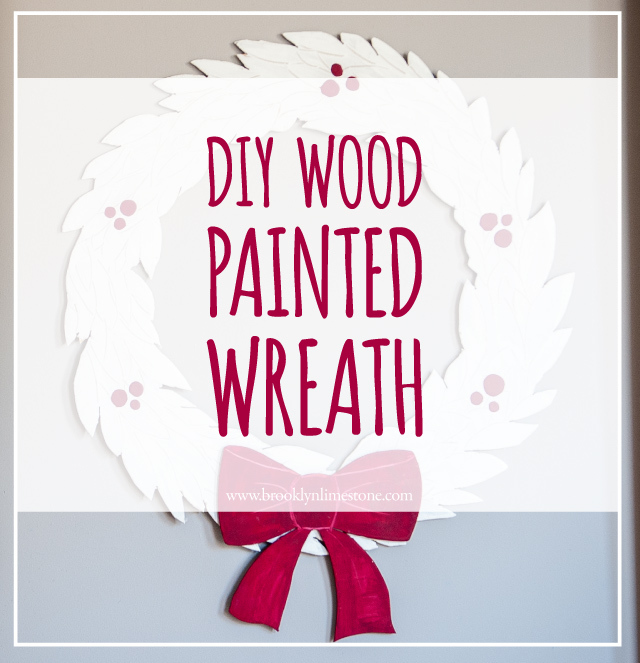 Finally attach the bow to the wreath using wood glue and allow to cure completely overnight. Voila! A modern painted wood wreath you can hang just about anywhere that will last a lifetime. ps: For those of you who asked what I end up doing with my Halloween decorations, this is a good example. This wreath was once the Zuckerman's pig sign. You make it look so easy. Beautiful start on Christmas decorations!